Ready to renovate or remodel your bathroom? Browse the before and after photos of bathroom remodeling projects below for ideas and inspiration. Our Project Managers will help guide you through the entire process. 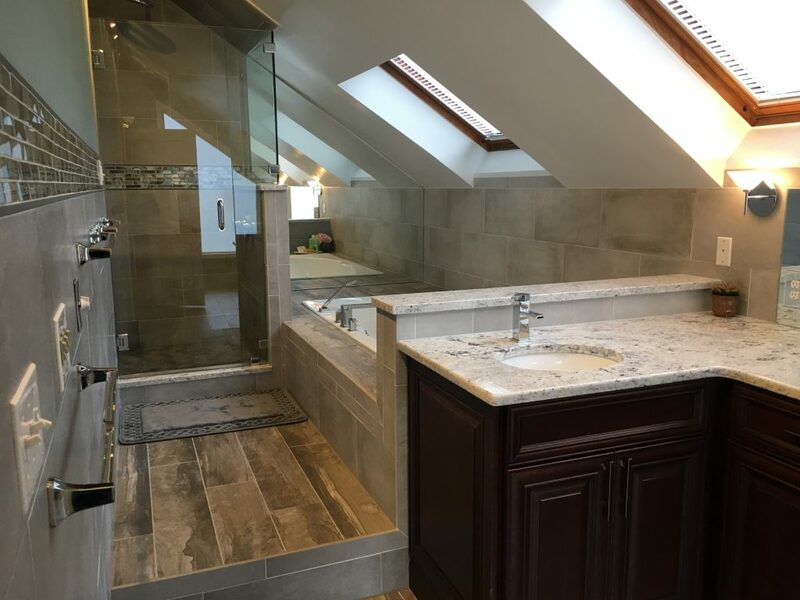 Did you know we have a bath showroom in Morristown? Our in-house Designers will create your perfect bathroom layout and help you select materials from our showroom. 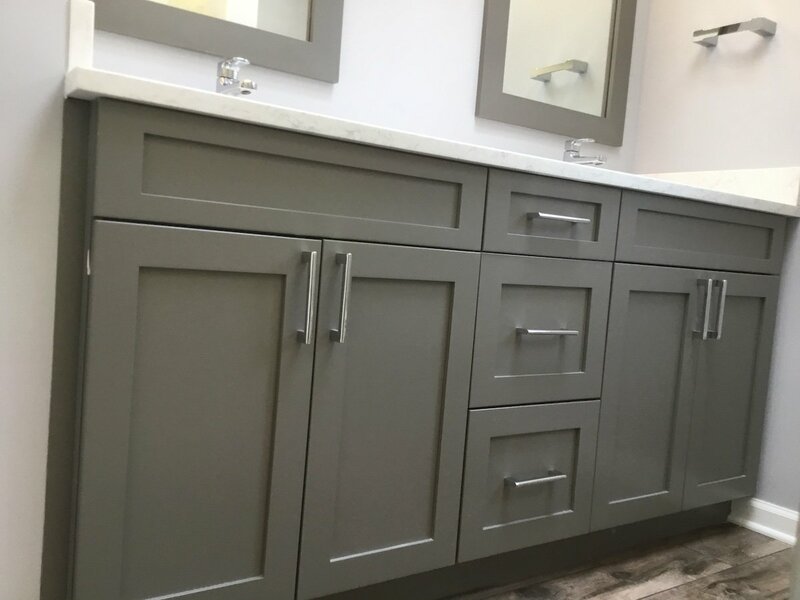 We feature everything you’ll need for your bathroom – cabinetry and vanities, countertops, tile, fixtures and hardware. These services are completely complimentary. Call 973-635-7900 to schedule an appointment today. You’ll see we are much more than just painters. 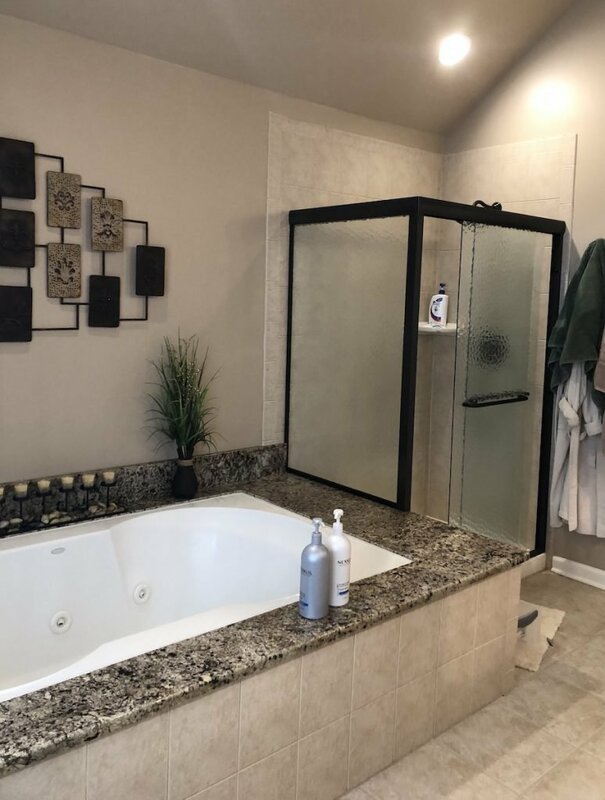 Let Monk’s Home Improvements turn your dream bath into reality! This hallway bath renovation transformed a dated, disparate space to a stylish and fully coordinated room. See this new hallway bathroom by Monk's. 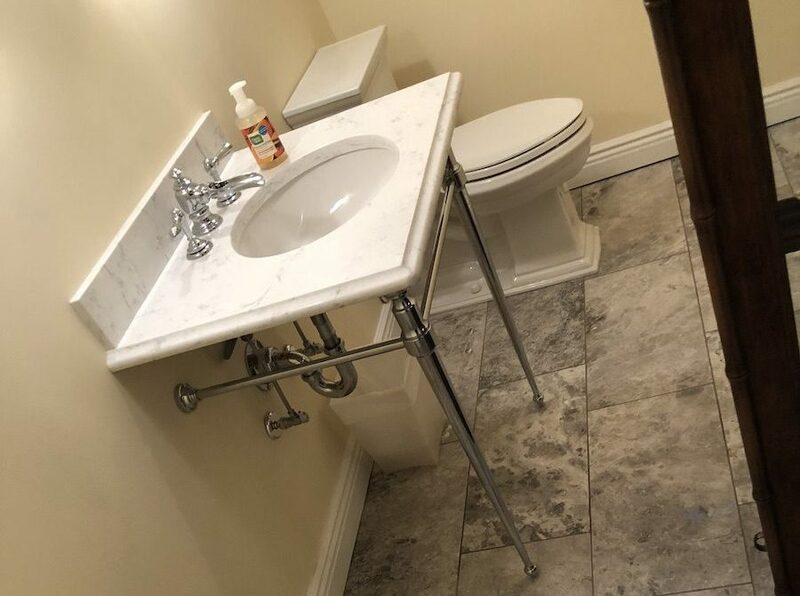 A hotel-style hallway vanity was relocated to the main master bathroom. See how we reconfigured the room and updated the design. 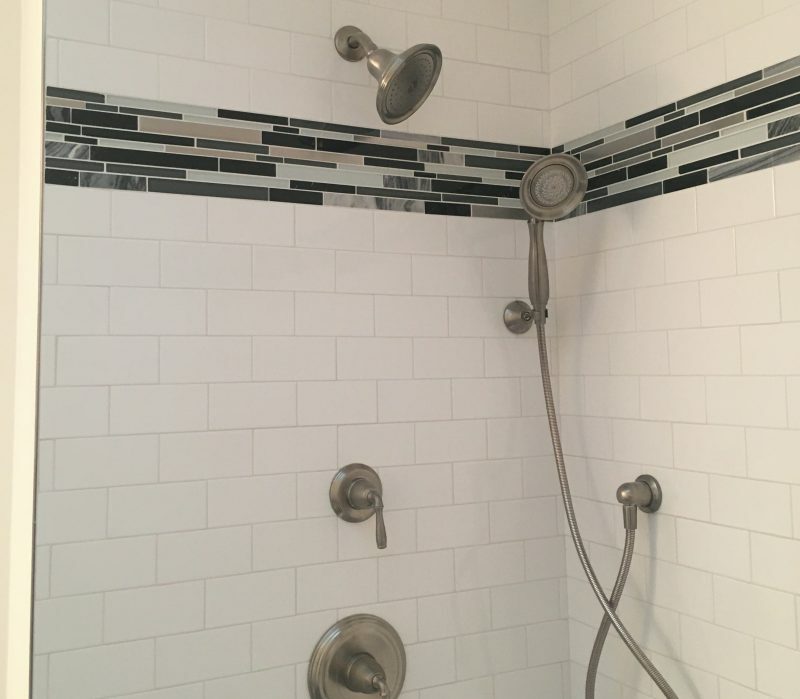 These homeowners wanted a reconfigured shower, as well as a new freestanding tub. See how we delivered their wishlist, even with limited space. A boy's bathroom with standard features got a masculine makeover. 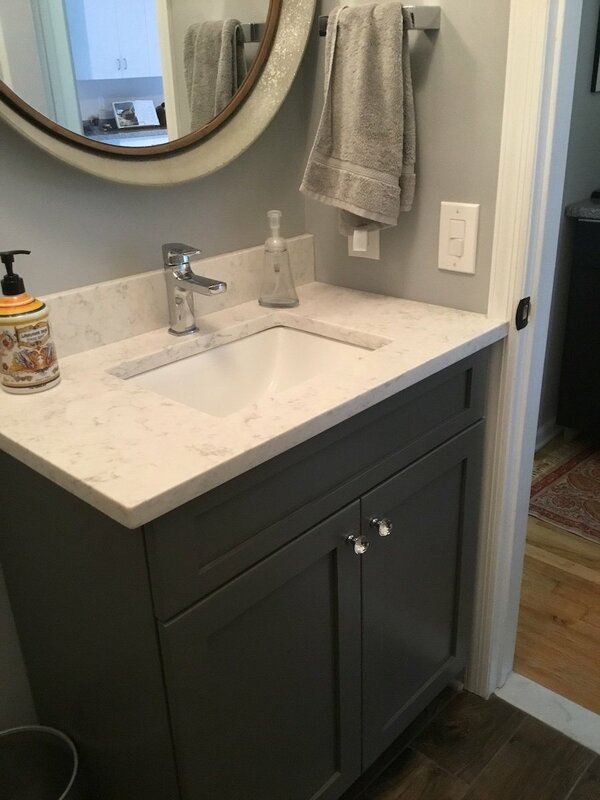 New concrete countertops, grey cabinetry, and dark grout transformed this hallway bathroom. 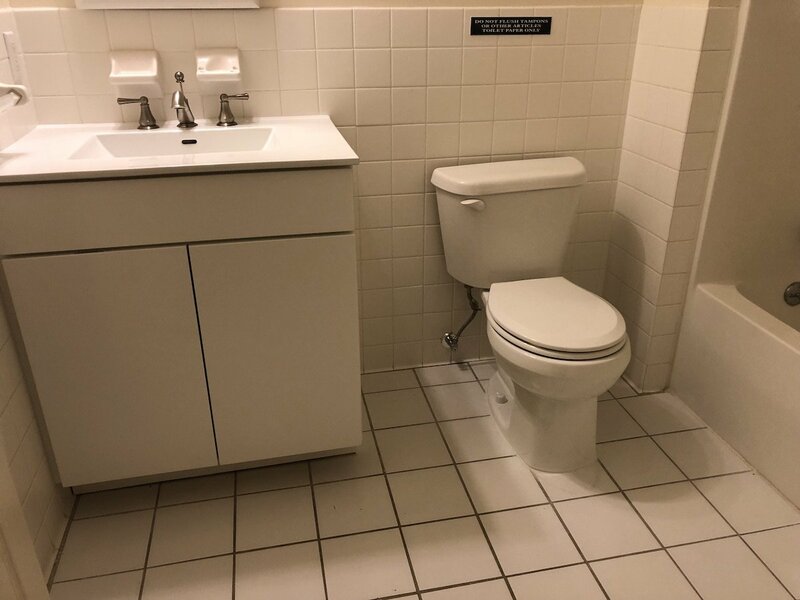 An awkward bathroom was given a new layout by utilizing adjacent closet space. This once higgledy-piggledy bathroom is a single, beautiful room. An affordable master bath upgrade is possible by swapping out a few key elements. See how we did it in this Randolph, NJ home. 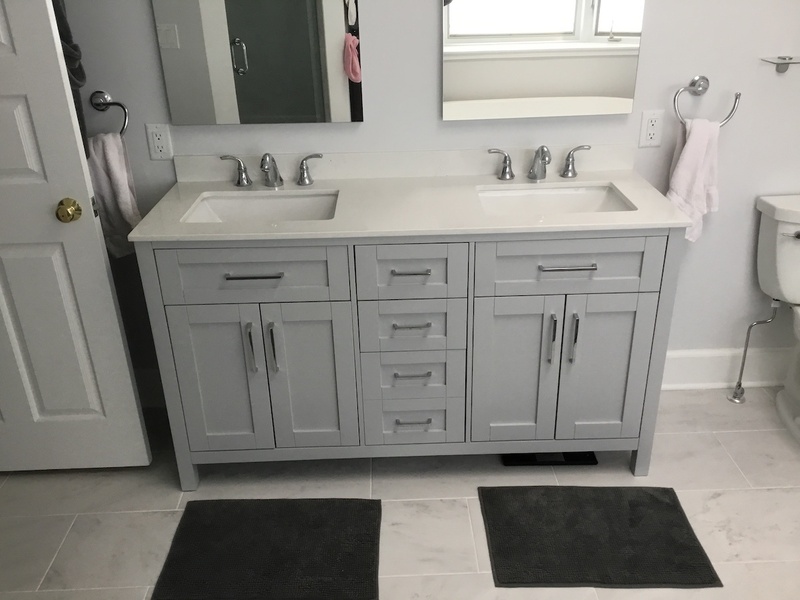 A simple vanity replacement is an immediate and cost-effective way to upgrade your bathroom. 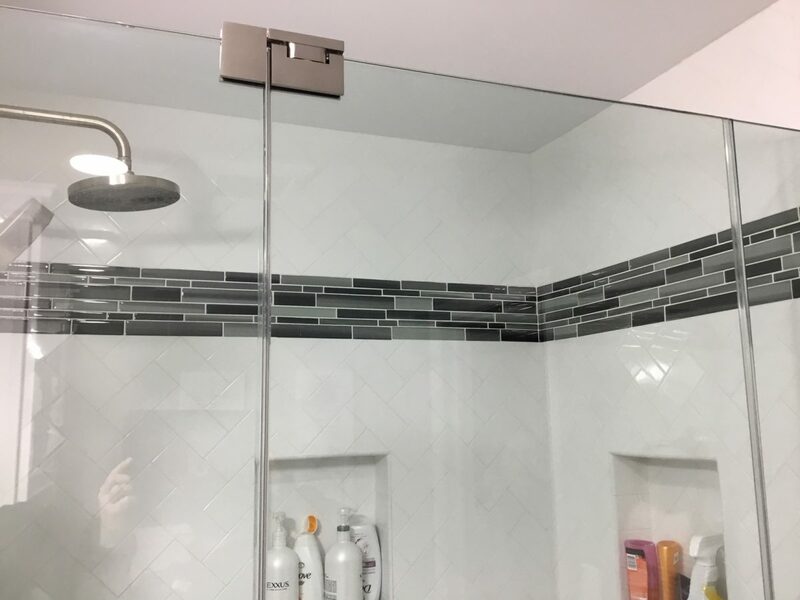 This renovation was complete in just a day. 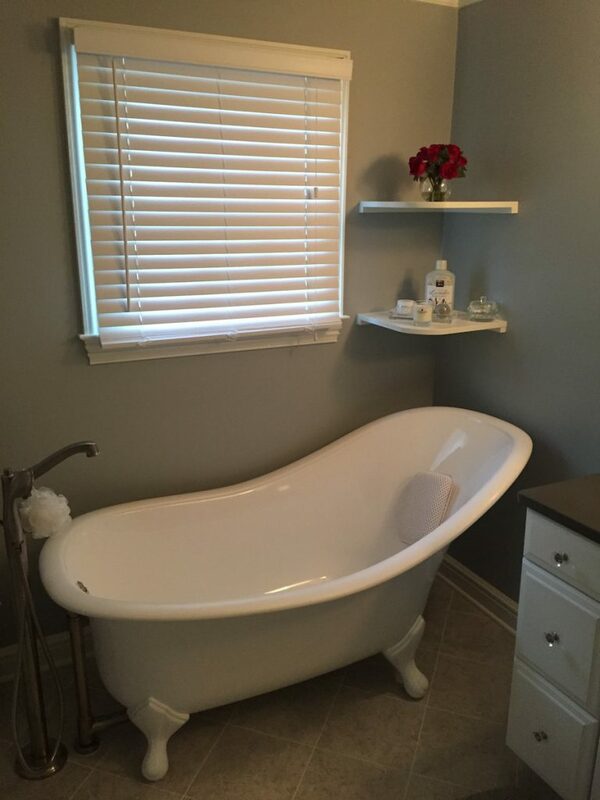 Monk's provided a basement half bath remodel after being water damaged. The dated mauve bathroom is now a delicate powder room. Monks provided a complete bathroom renovation. Goodbye, peeling wallpaper and blue tile. Hello, timeless neutrals. See this transformation! 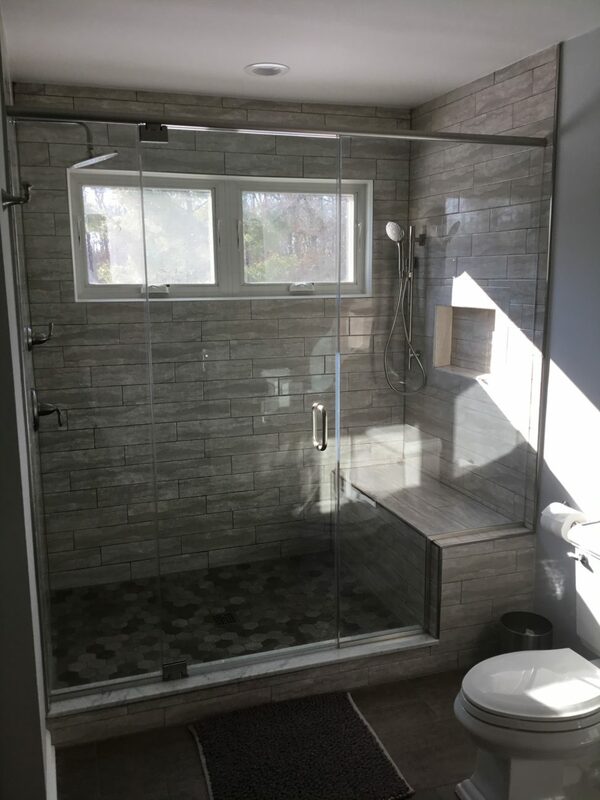 We provided an original bathroom overhaul in this Morris Plains NJ home. All the brown was replaced with fresh gray and white finishes. See the difference! A masculine bathroom remodel transformed these boys' hall bath which featured busy wallpaper and red sinks. See the transformation! 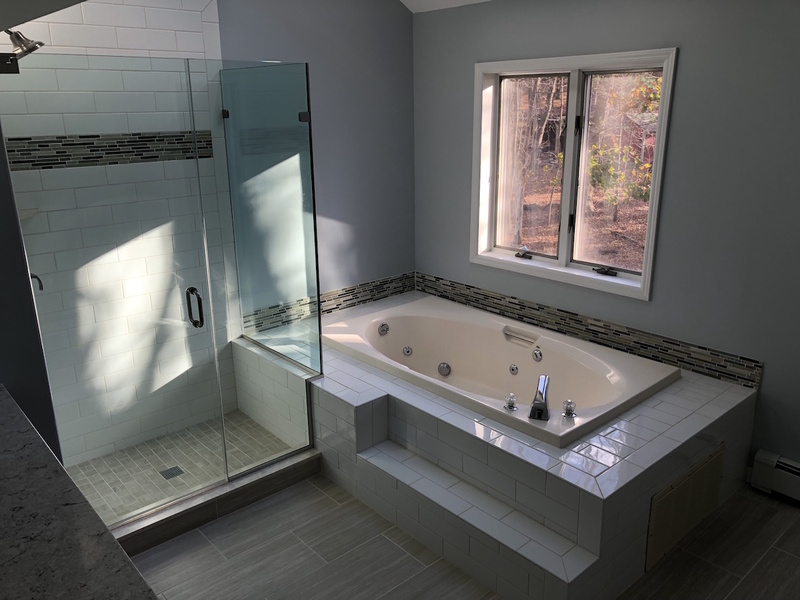 By maintaining the bathroom footprint, we were able to complete this Morris Plains master bath makeover in a couple of weeks. 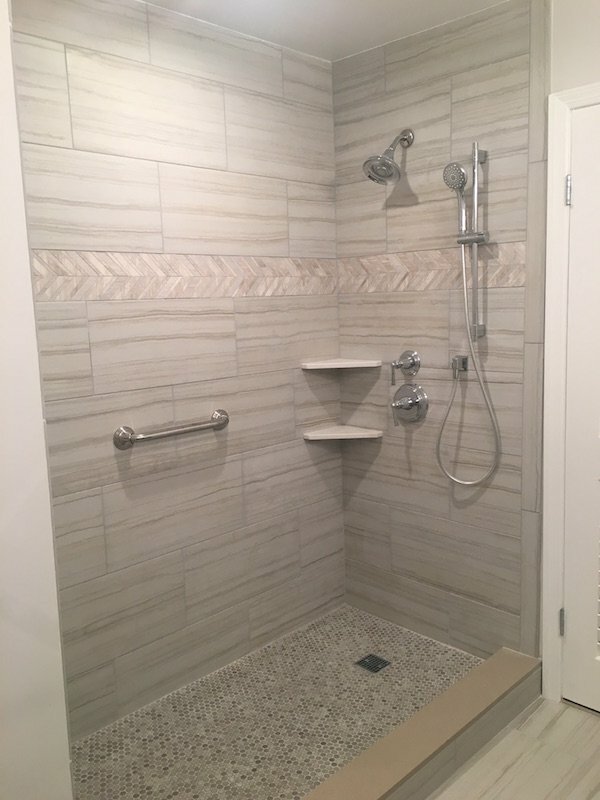 See the beautiful new finishes including a herringbone patterned wall tile and basket weave shower floor! 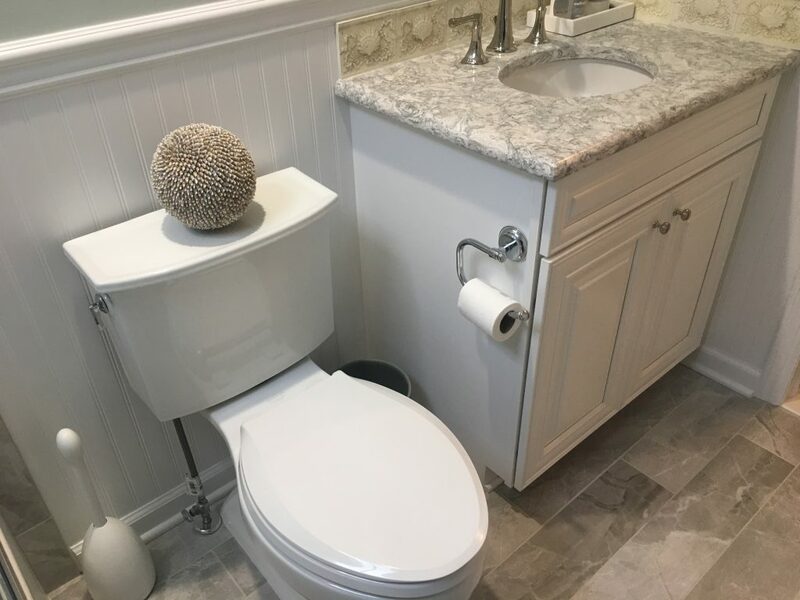 Integrating New and Old Items in a Bathroom Remodel Is a Great Way to Minimize Your Project Timeline and Cost While Maximizing Results. See a Blended Bathroom Project by Monk's Here. 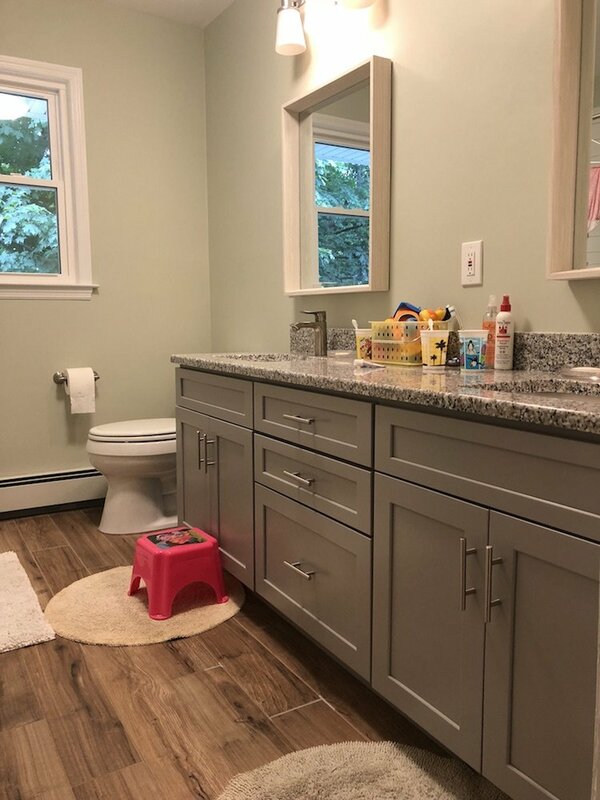 This hallway bathroom received an upgrade, giving this new kids bathroom a fresh, fun look. Monk's can do the same for your bathroom. 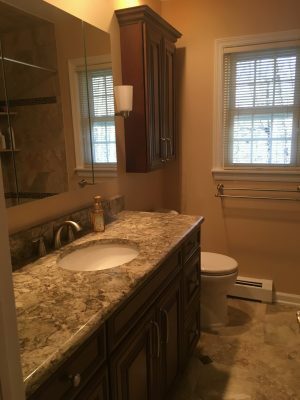 This Bathroom Makeover Boonton NJ Took This Bathroom From Dated and Aqua to Updated and Neutral. See New, Serene Bathroom Here. 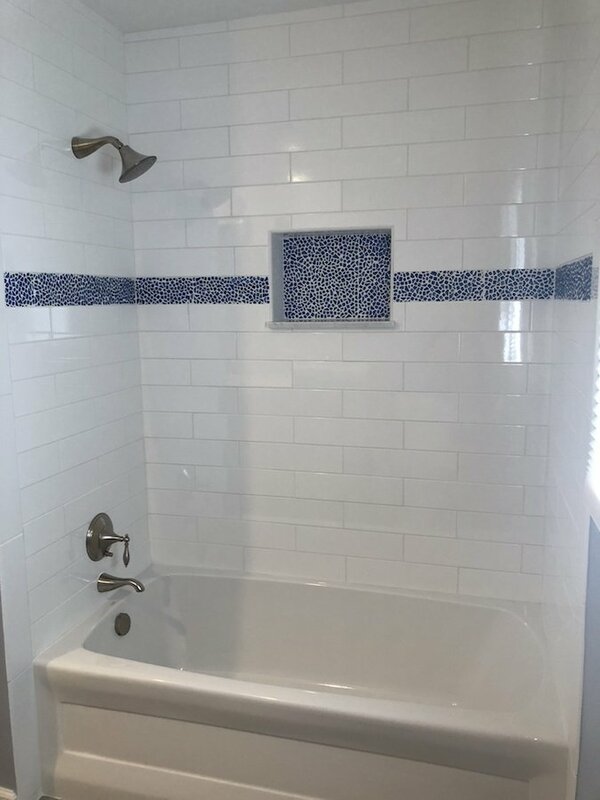 The Unused Tub Was Removed and a Brand New, Beautifully Tiled Shower With Adjustable Shower Head Was Installed. See The Pink and Mauve Before Photos and the Soothing, Neutral After Photos. 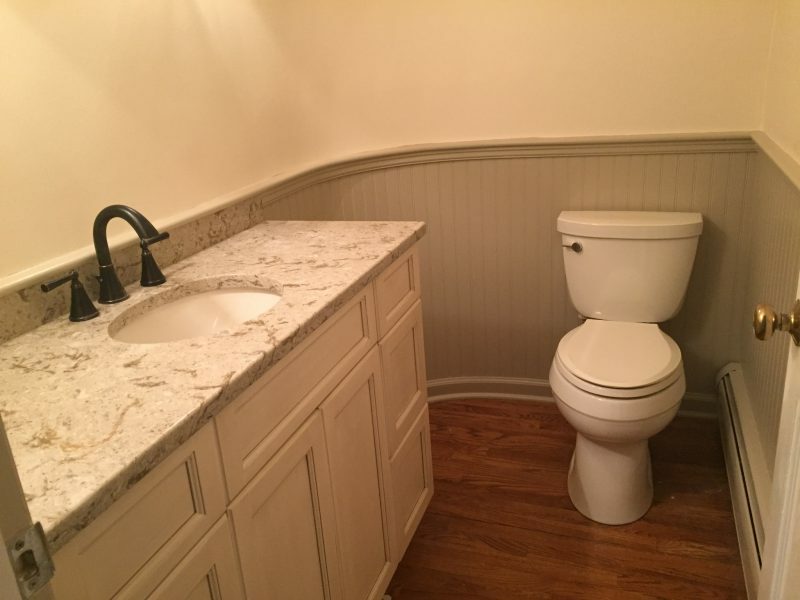 We Had to Gut and Reframe this Morris Plains Bathroom So We Could Remodel After Termite Damage. 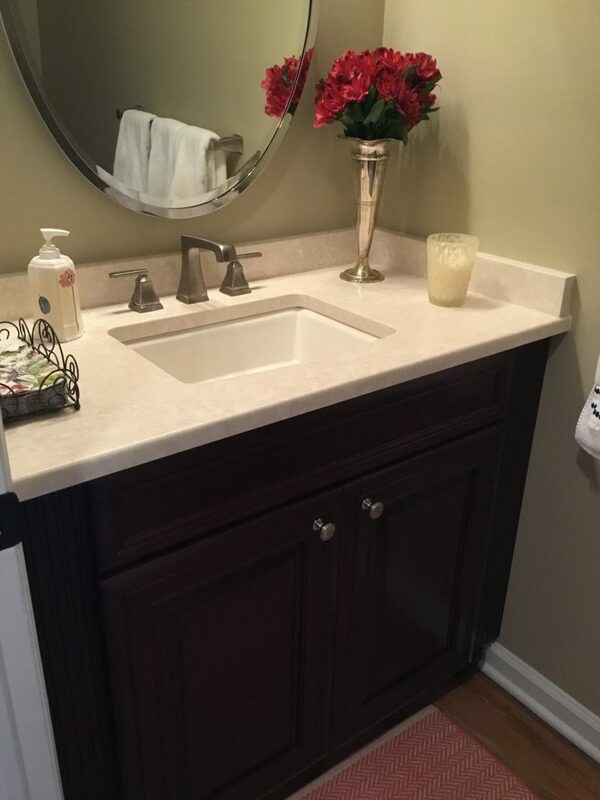 We Also Reconfigured The Space To Provide a Larger Vanity. Maneuvering a bathtub gets increasingly difficult as we age. 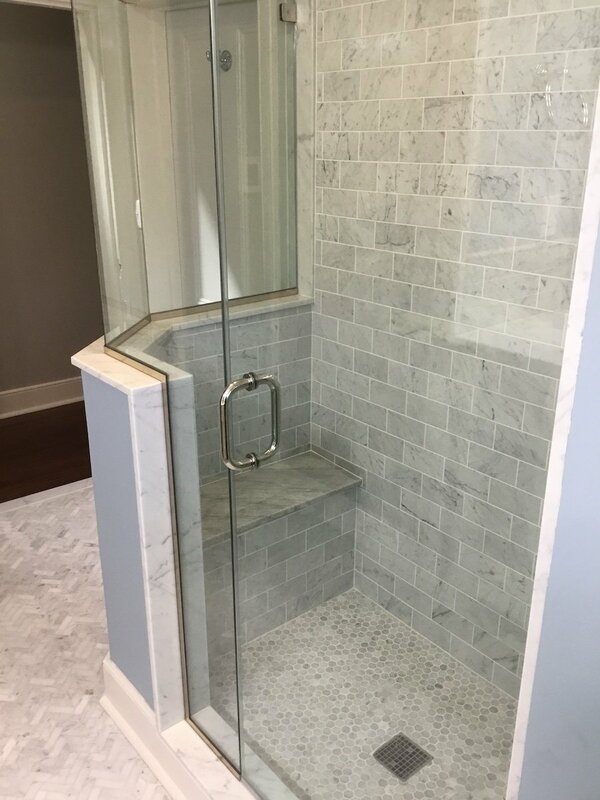 A great option is converting a tub to shower to make bathing safer. 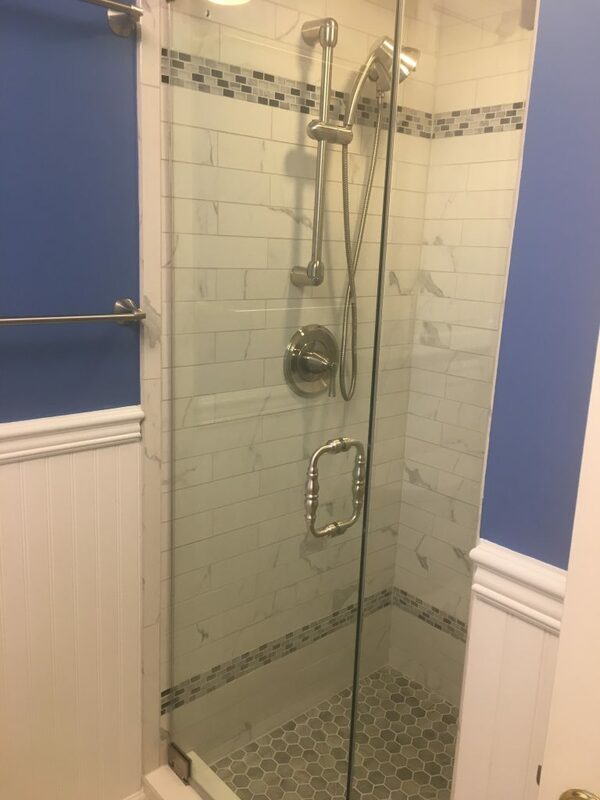 See how we created a safe and beautiful shower in this Madison, NJ home. The curved wall of this powder room was treated to flexible bead board paneling. 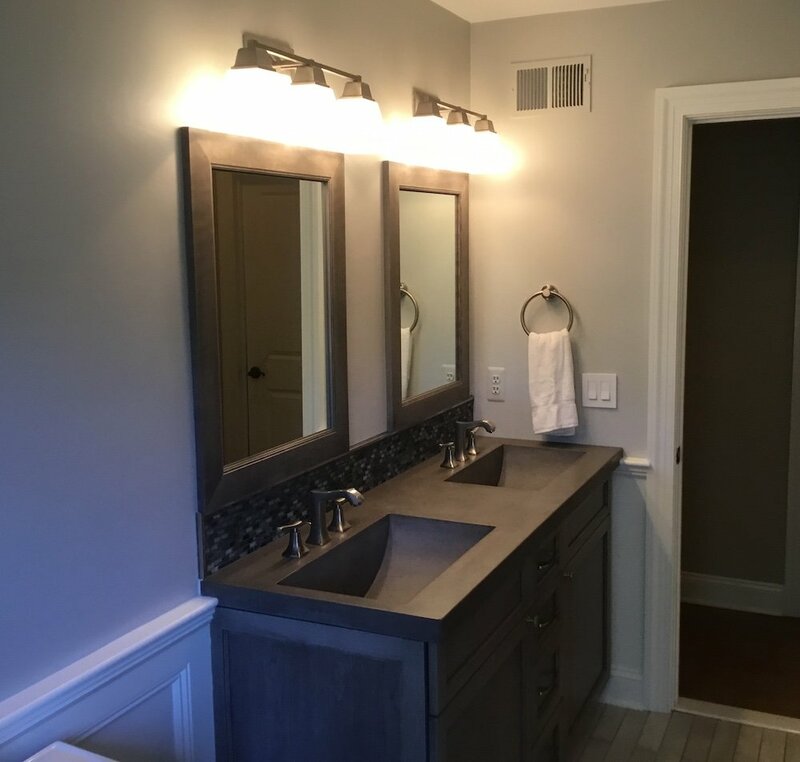 We also installed sconces into the large mirror over the vanity. See the result! This Bathroom Remodel Bridgewater NJ Features a Modern Free-Standing Tub, Double Corner Vanity With Storage Tower and Tiled Shower. See The Beautiful Results. The floor of this wood and mirror-filled bathroom was caving in. We rebuilt the room and turned it into a functional and lovely little space. See the Before & Afters. 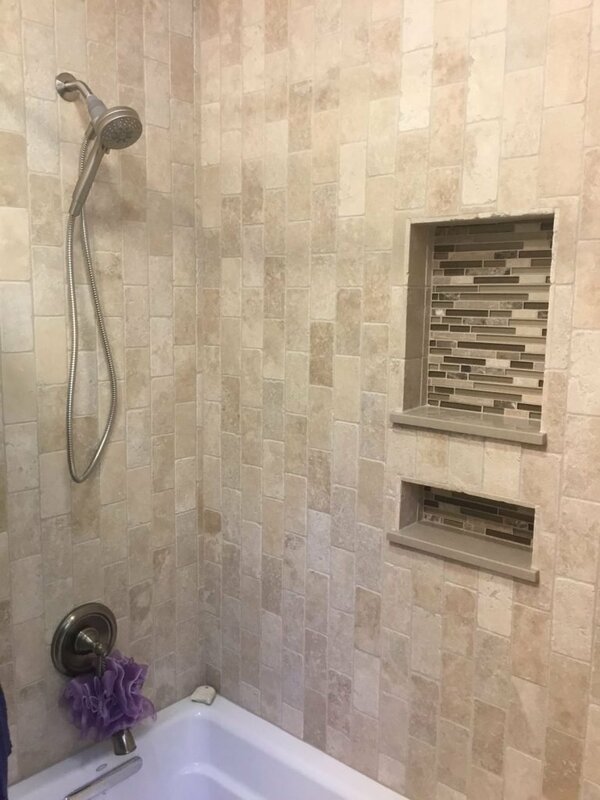 This Small Master Bathroom Was Given a Fresh Update, With New Storage and More Open Shower. See the Before and After. 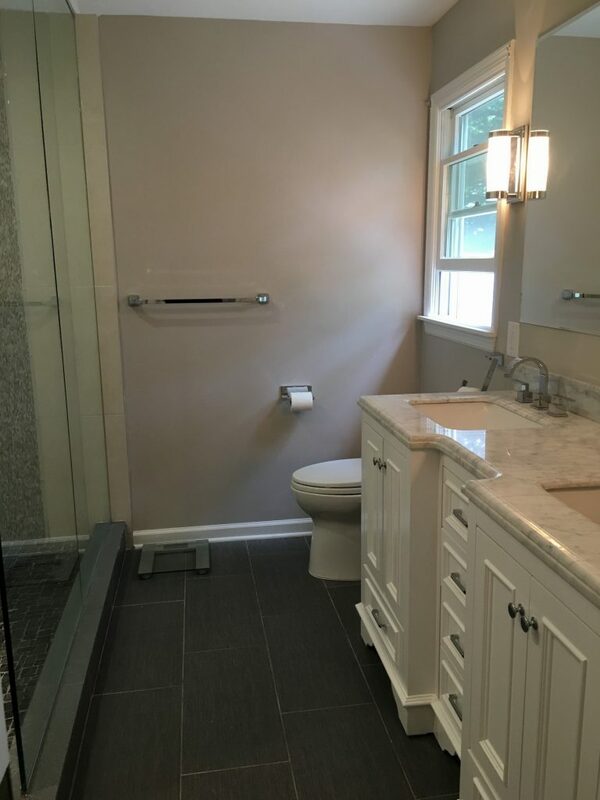 This bathroom makeover in Summit, NJ delivered an updated look as well as added safety features. This dated hall bath was completely gutted down to the studs. 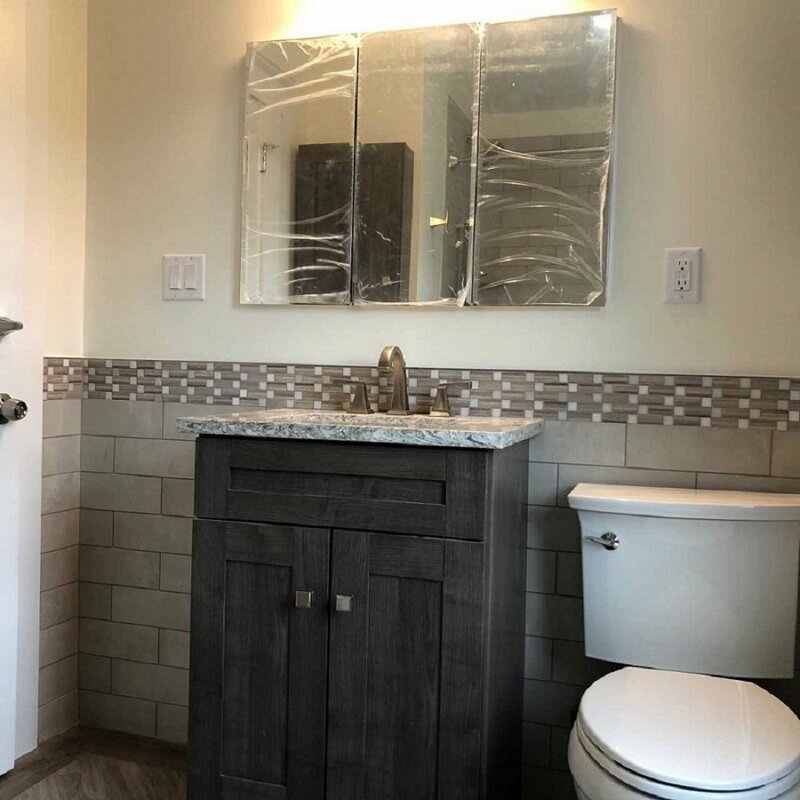 We rebuilt the bathroom complete with a new tub and double vanity and mosaic tile floor. 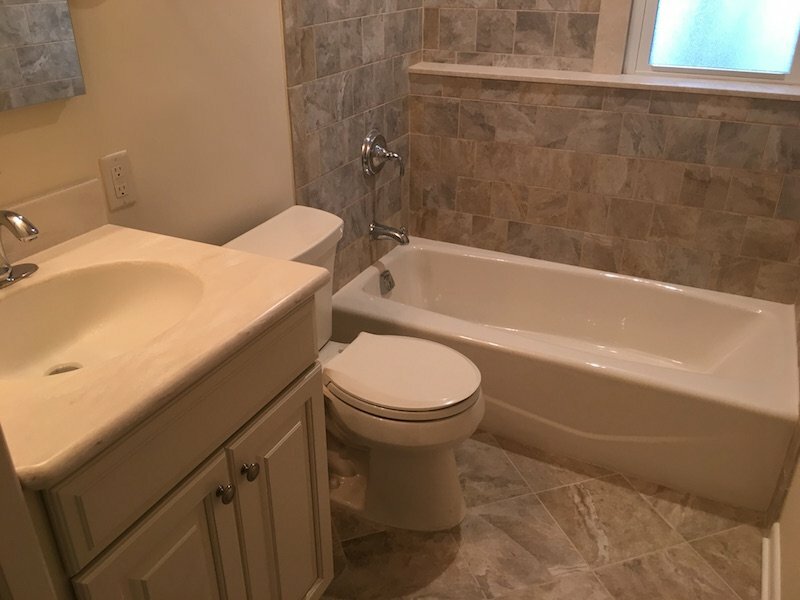 We brought this NJ hallway bathroom to present day with new tile, vanity, quartz countertop, tub and fixtures. See the before and after. A home with a steeply pitched roof provides a chance to get creative. 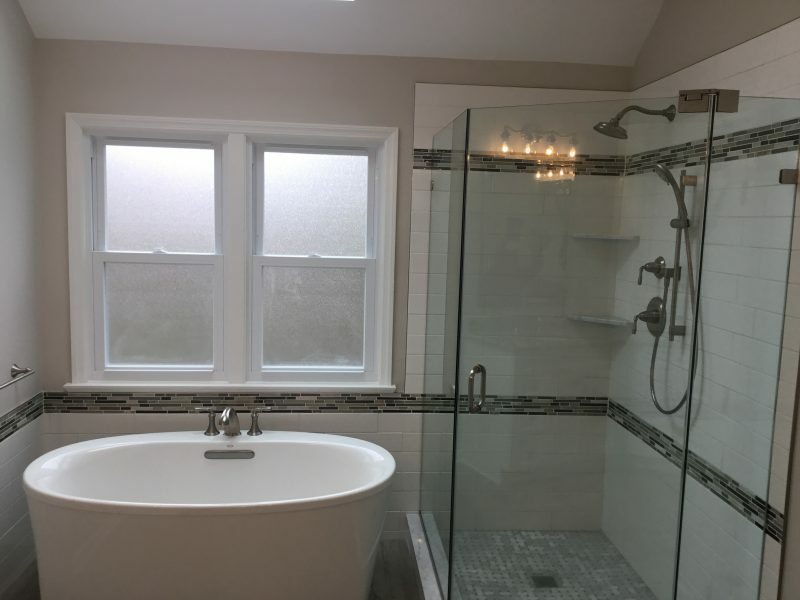 See how we managed this master bath remodel in Morristown, NJ. 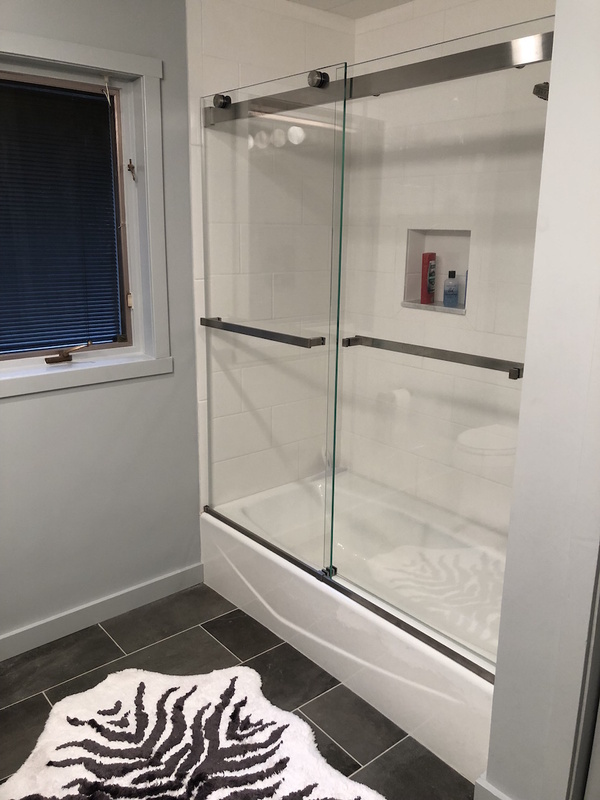 Complete Bathroom Remodel Morristown- Our team at Monk's completely revamped this bathroom by removing the tub and making room for an expanded shower. 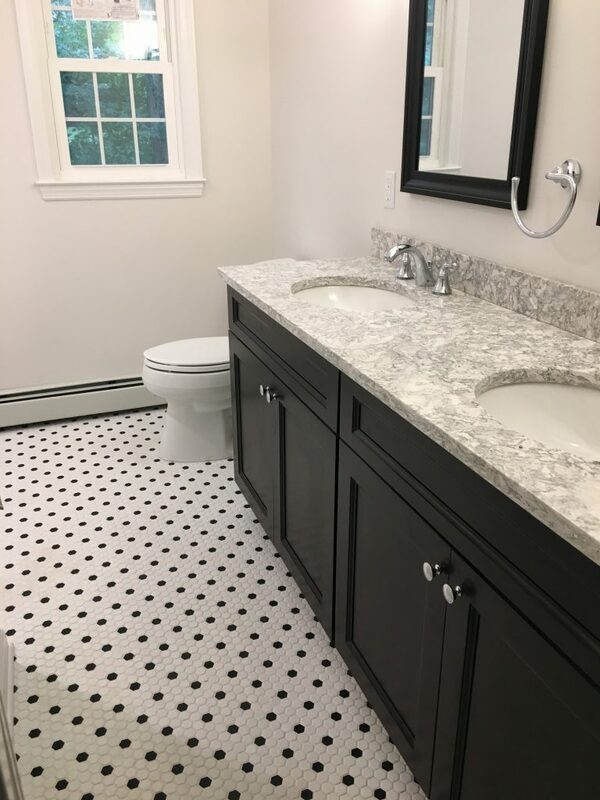 This Madison, NJ powder room was updated with wallpaper removal, and a brand new vanity, hardwood floors, and paint job.